Earlier today I was shocked to read this article in which it was made clear that Leicester brewery Everards was on the verge of driving a small independent Scottish brewery out of business over the most phenomenally overzealous intellectual property issue, and something you’d expect to see from the likes of Starbucks rather than a family-run British brewery that seemingly prides itself on traditional values. Elixir Brew Co was seemingly facing extinction over trademark issues – Everards filing a trademark application brought about by the release of a seasonal ale in 2012 named Everards Elixir despite being on slightly iffy ground by naming one of their beers ‘Tiger’ – Pot. Kettle. Etc. 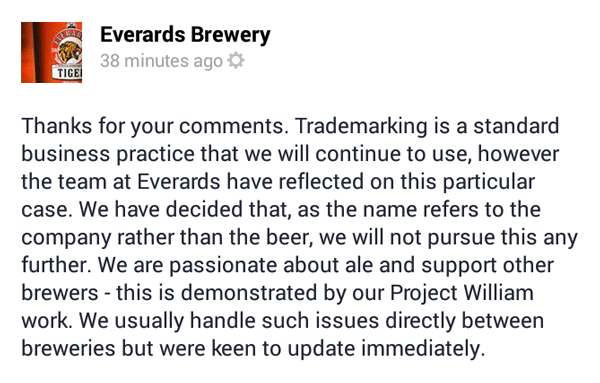 While there was never likely to be any confusion whatsoever between the two breweries or their products, Everards seemed undeterred by the prospect of driving a small brewery out of business nonetheless, despite not even having bothered to contact Elixir founder Ben Bullen prior to their legal assault, nor apparently bothering to respond to his attempts to contact them and to find some form of compromise – preferring instead to hide behind their legal team. 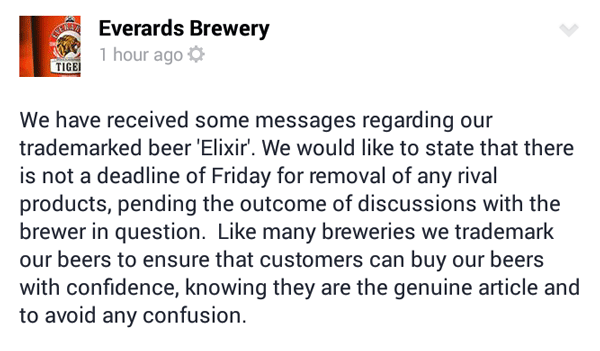 Faced with just one week to comply with Everards legal demands and unable to bankroll a legal fight over the issue, things were looking immensely bleak for Elixir Brew Co. Incensed by the lunacy of the situation, many people took to Everards Facebook page to voice their opinions, which ranged from simple insults to well-rounded arguments – both having their place in terms of making a point and adding to the growing momentum against such a disproportionately litigious approach to a tremendously farcical situation. Anyone convinced by this? Thought not. Cue further enlightened comments, interspersed with abuse, insults and veiled threats, as is the way of the internet.